Why You Should Plan a Honeymoon in St. Lucia from Linda Dancer of Honeymoons Inc.
Planning a honeymoon? It's hard to decide on one place in the entire world to travel to! But what means the most to you? Adventure? Relaxation? Ocean views? A beautiful landscape? If you said yes to all of these questions, then a St. Lucia honeymoon might be for you! Our local Nashville honeymoon planner, Linda Dancer of Honeymoons Inc. is here to give us all the scoop on the beautiful island of St. Lucia! I'm not going to lie, it's been on my bucket list of places to travel to for quite some time now. I'll let Linda take it from here and tell us all about the adventure, relaxation, ocean views and beautiful landscape of St. Lucia! 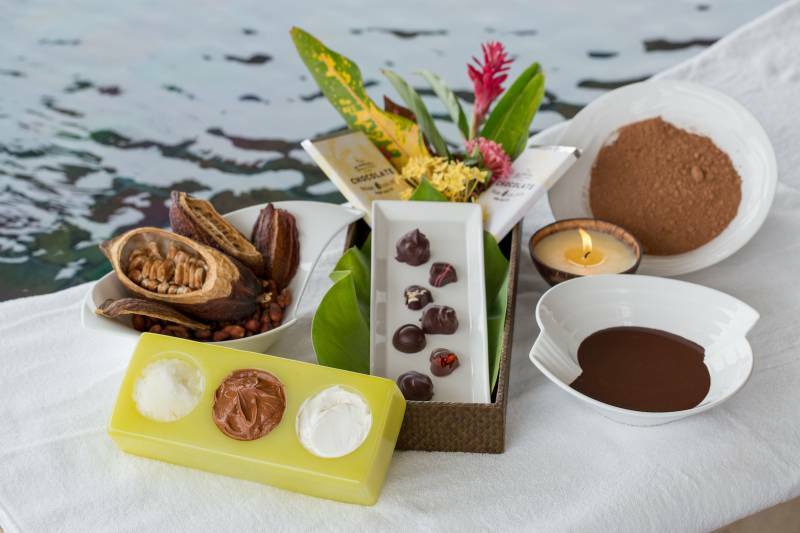 Tell us all about St. Lucia! How is it different from other Caribbean islands? Linda: St Lucia is the only country in the world named after a living woman - Saint Lucy of Syracuse by the French (first European settlers on St Lucia). 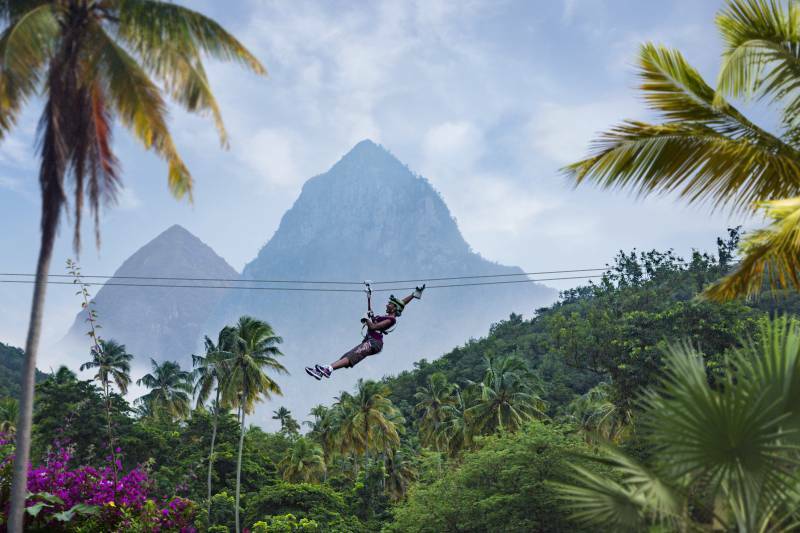 If visiting all the World Heritage sites is on your bucket list, then add St. Lucia to this list as The Pitons, St. Lucia - twin volcanic peaks are a (UNESCO) world heritage site and the symbol of St. Lucia. 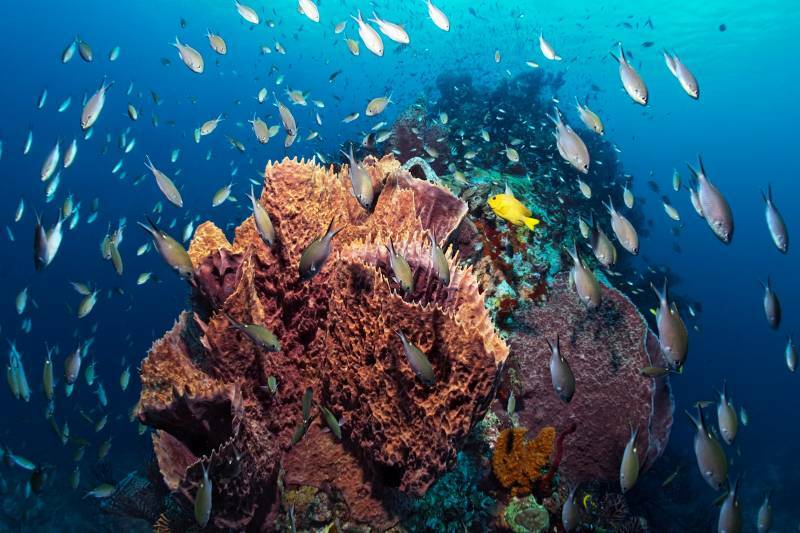 St Lucia is home to the world's only drive in volcano and boasts a beautiful rainforest. 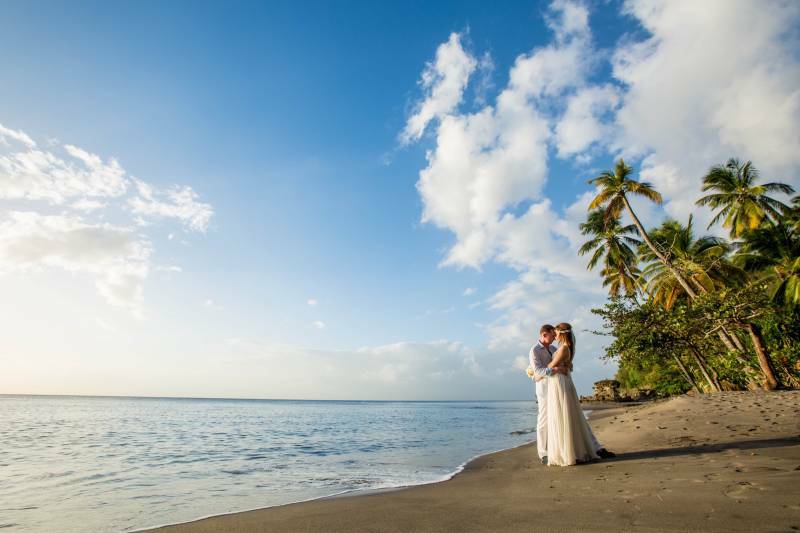 Why do couples choose to honeymoon in St. Lucia? Linda: Romance means something different to every couple - while one might just want a beautiful beach and unlimited food and drink included in their honeymoon package, most of my clients want to experience the destination. And there is no better destination than St Lucia for clients to share once in a lifetime experiences together. Often nicknamed the "Hawaii" of the Caribbean, with volcanos, waterfalls, black sand beaches and more. 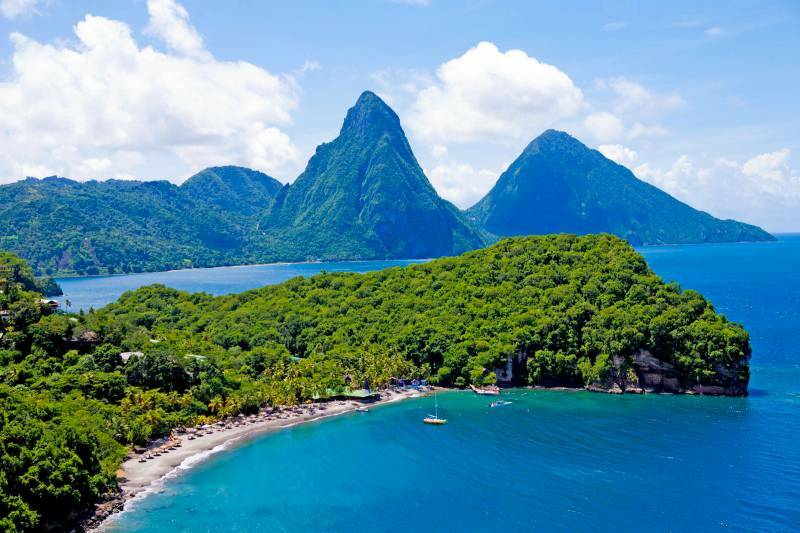 There are many similarities between the two destinations but for those of us on the east coast, St. Lucia is a much quicker plane ride and there are many all-inclusive options for clients to consider. Can you name some of the best resorts in St. Lucia? 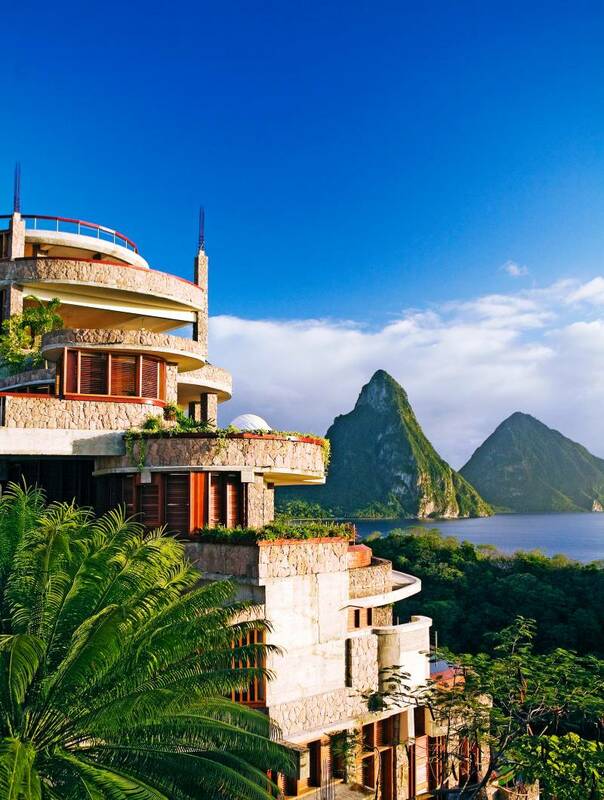 Linda: One of my favorite resorts is St. Lucia Jade Mountain - it's truly one of a kind. 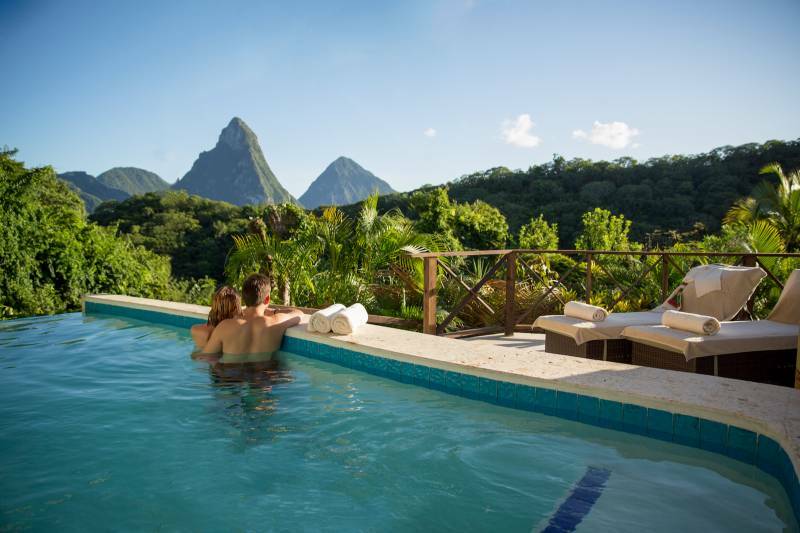 The sanctuaries start at the bridge leading to your suite, with elevated tubs with amazing views of the Pitons. They also have three walled suites with infinity edge pools and you can even arrange dinner to be served on your bridge or by your pool. Sugar Beach, A Viceroy Resort is situated on the beach directly between the two Piton peaks. This resort is straight from a story book (formerly the Jalousie Hilton). The treehouse huts in the Rainforest Spa are magical and the special couples massage treatment room includes a pool. The beach and pool are postcard worthy. 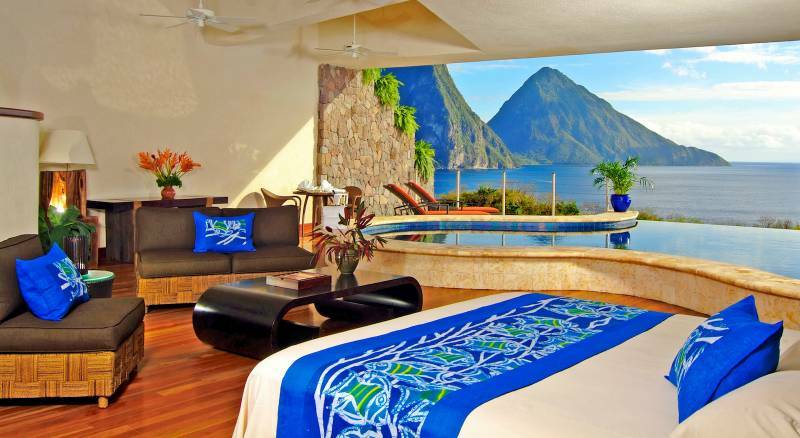 Ladera Resort has 37 eco-friendly suites - 3 walls with amazing views of the Pitons and various suites with private plunge pools. Each is unique and located on a volcano ridge line 1000 feet above the Caribbean Sea. There's hand crafted furniture on site by local St. Lucian artisans with island vibes infused in the design..It's a luxury retreat for adults only with an award winning restaurant Dasheene. There are actually three Sandals Resorts currently on St Lucia where guest enjoy stay. Sandals Grande St. Lucian has a casual elegant vibe with arrange of accommodations that include overwater bungalows, rondovals with private pool sanctuaries. At Calabash Cove, my good friend Konrad Wagner has created a beautiful boutique resort. They have sunset junior suites and water's edge cottages with private plunge pools. Windsong Restaurant has great food and unobstructed views of the Caribbean Sea. 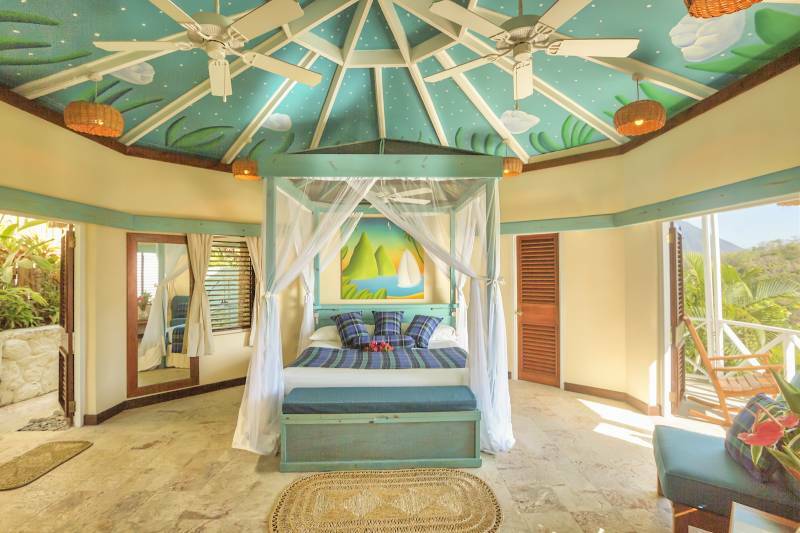 Quirky is a great word to describe Anse Chastanet, the sister resort to Jade Mountain. Both are owned and designed by architect Nick Troubetzoy. From beach front suites to premium hillside suites, don't be alarmed if a tree grows through your shower to tower above the resort. Nick thoughtfully considered every square inch of each suite as he built the resort. Open air showers will have a huge mirror to reflect the Pitons in the back ground. Each one is situated for absolute privacy. Plus, three wall suites and some have wooden louvre walls that open to balconies and patios. All the decor is made of local wood, also known as the island's "national madras cloth". Art by local artisans combine to give guests a sense of place unlike any other. 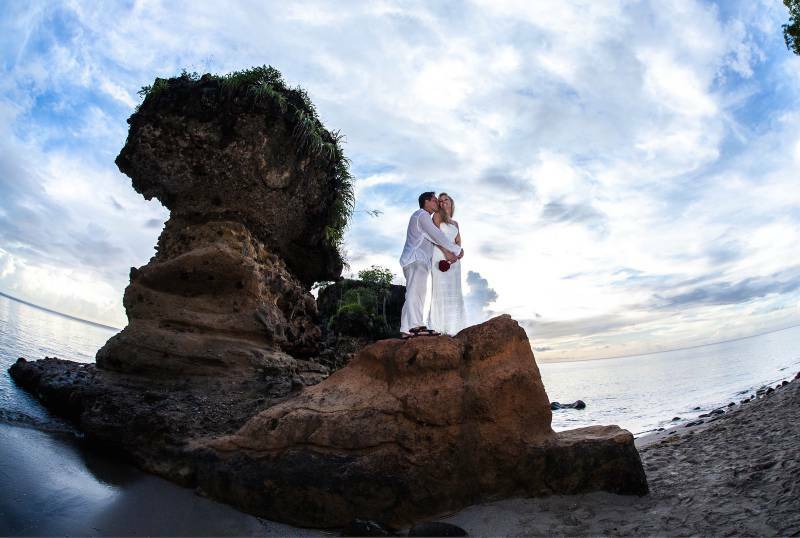 Clients seeking to have an action packed honeymoon love this resort because of all the options nearby from hiking, diving, mountain biking, spa and so much more. How are the resorts unique? 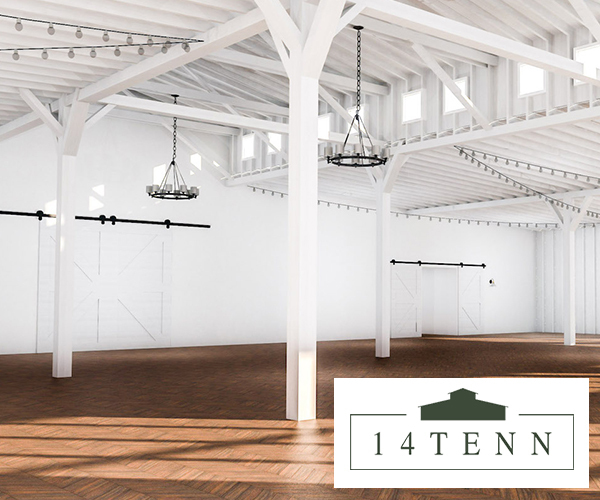 What are some of the best amenities offered? Linda: One word of caution - I spend a great deal of time talking with my clients to see what experience they want during their honeymoon. With many of my clients, one wants to just relax by the beach and the other wants lots of activities. Keep in mind that many of the resorts I mentioned above are one of a kind and unique and boutique. So clients really need to understand what that means so they will not be bored upon arrival. Each couple and I have an in depth discussion where we go over all the details so that expectations are met upon arrival. As fabulous as these resorts are, and regardless of the price paid to stay there, if the clients do not truly understand the differences in the resorts they can still be disappointed because it wasn't what they thought it would be. This is why I travel often to the resorts to be able to share my personal experiences, photos and videos with my clients to paint a true picture of the experience they should expect to have. Some of the resorts I mentioned are very pricey so I have lots of out of the box ways I help clients stretch their budget further to create the honeymoon or vacation of a lifetime in St. Lucia. 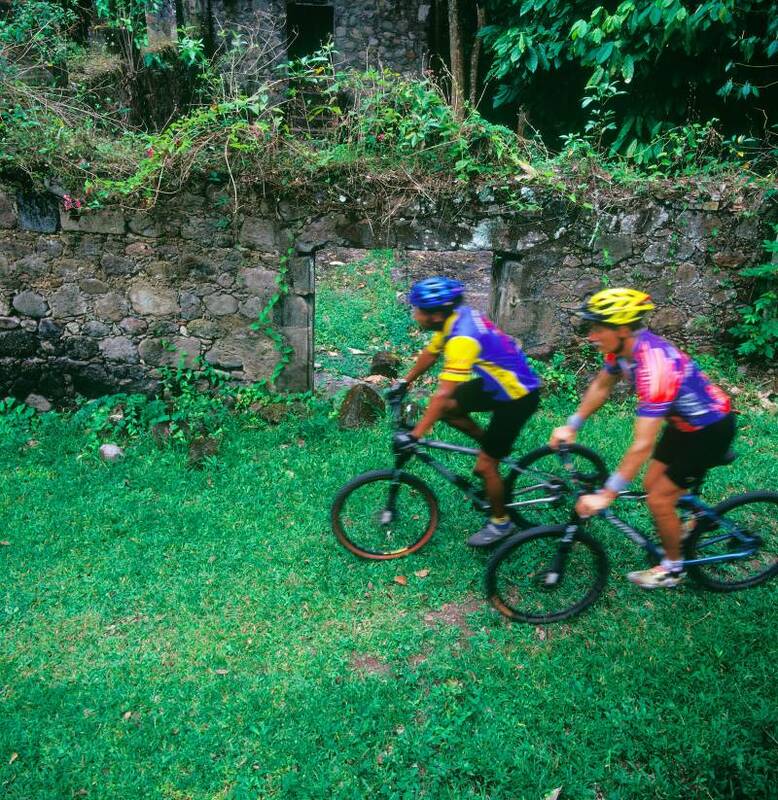 What are some of the most fun and popular activities to do in St. Lucia? Linda: The Land and Sea Tour called Joe Knows Tour is probably the most popular. Island Routes can make all the arrangements and the tour begins on a speed boat to Soufriere. Here you are introduced to many villages along the way then you transfer to awaiting shuttles that take you to the volcano for a fun and therapeutic mud bath. Visit the rainforest and swim under a waterfall, and stop for lunch and snorkeling before heading back to Port Castries. Spend the money and make the arrangements for helicopter transfers. I made the transfer from south to the north in 11 minutes, got a great tour of the island - then I was taken by transfer to my first hotel. Zip lining, hiking, bird watching and diving are all popular activities. 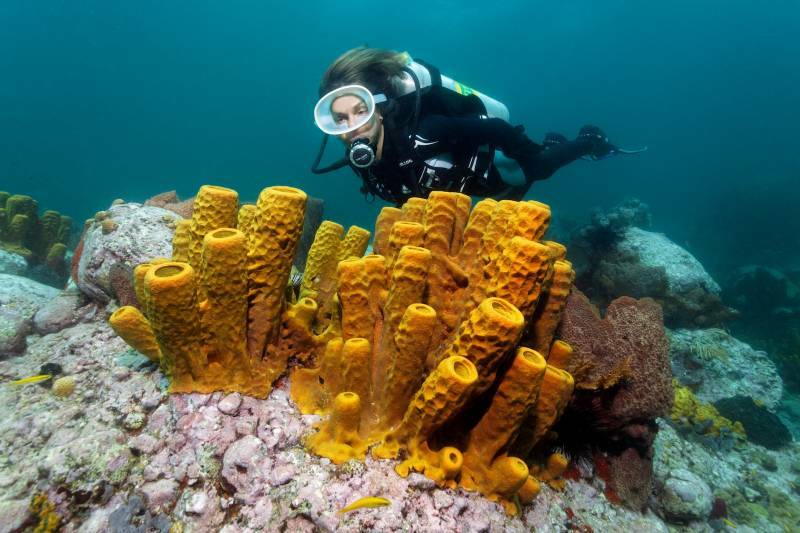 What are some hidden gems of St. Lucia? Linda: Depending upon where guests are staying I suggest they go out and mingle with the locals on Friday night. They can do this either at the traditional village Fish-Fry at Anse Le Raye or the Grose Islet Street Party. Bean to Bar chocolate tours at Boucan by Hotel Chocolat is another hidden gem. Diamond Botanical At the gardens and waterfall at the base of the Pitons, you can hike beautiful nature trails by a historic mill and waterwheel. You can even take a dip in warm mineral baths like Sulphur Springs - it's the world's only drive-in volcano. Visit Pigeon Island National Landmark & Museum is also fun. Marigot Bay a scenic natural harbor where several movies have been filmed. St. Lucia has many cultural festivals - many of my clients delay their honeymoon to travel to the island during these events. Carnival, the largest event, takes place from end of May - mid July. Different events are featured throughout this time frame around the island. And for my music lovers, St. Lucia Jazz Festival held in Castries is very popular as well. 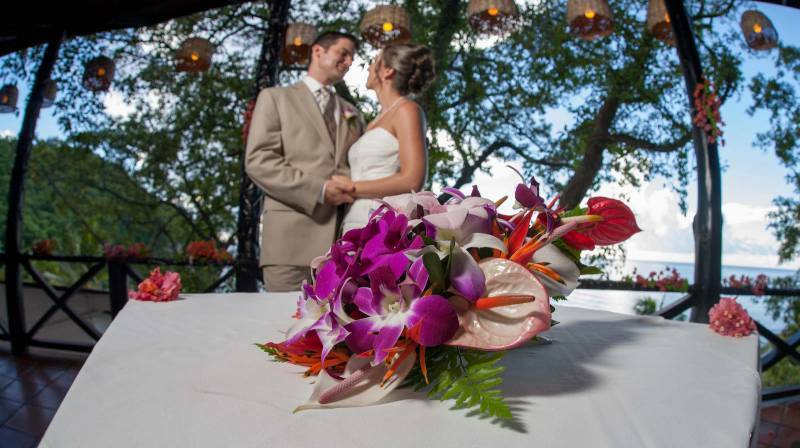 St. Lucia destination weddings are story book affairs. 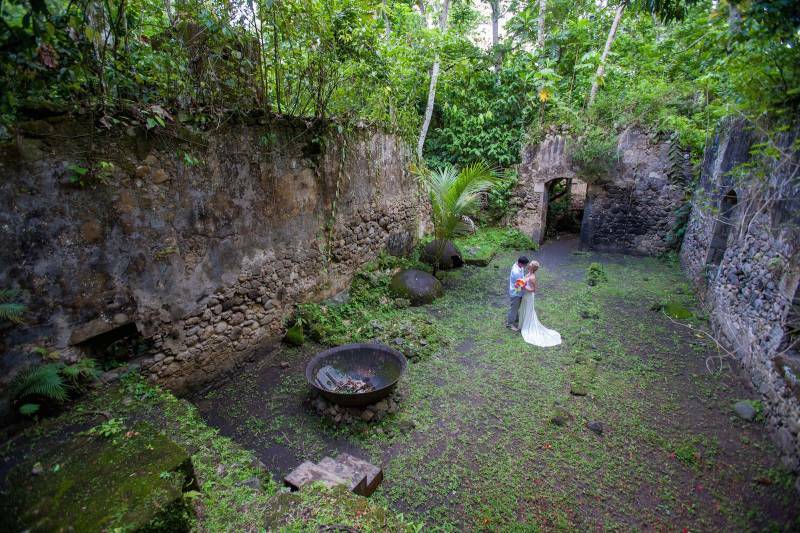 There are so many wonderful locations on the resorts as well as various locations around the resort that include historic ruins, private beaches, beautiful gardens, and roof-top locations near the Pitons. 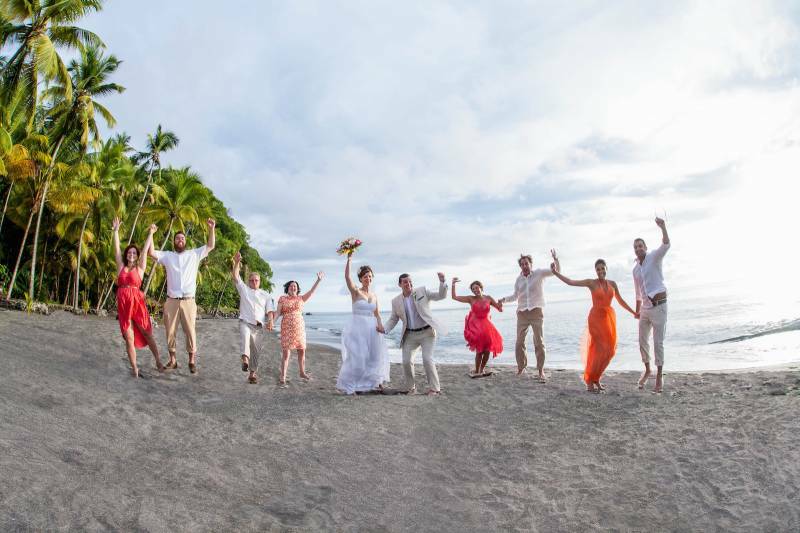 The various wedding teams I work on the island make all my clients' dreams come true. Is there anything else you'd like to tell us about St. Lucia? Linda: You just have to experience it for yourself. It's the perfect blend of luxury and nature. It's easily accessible with two airports, the larger international airport host arrivals daily from the USA market. 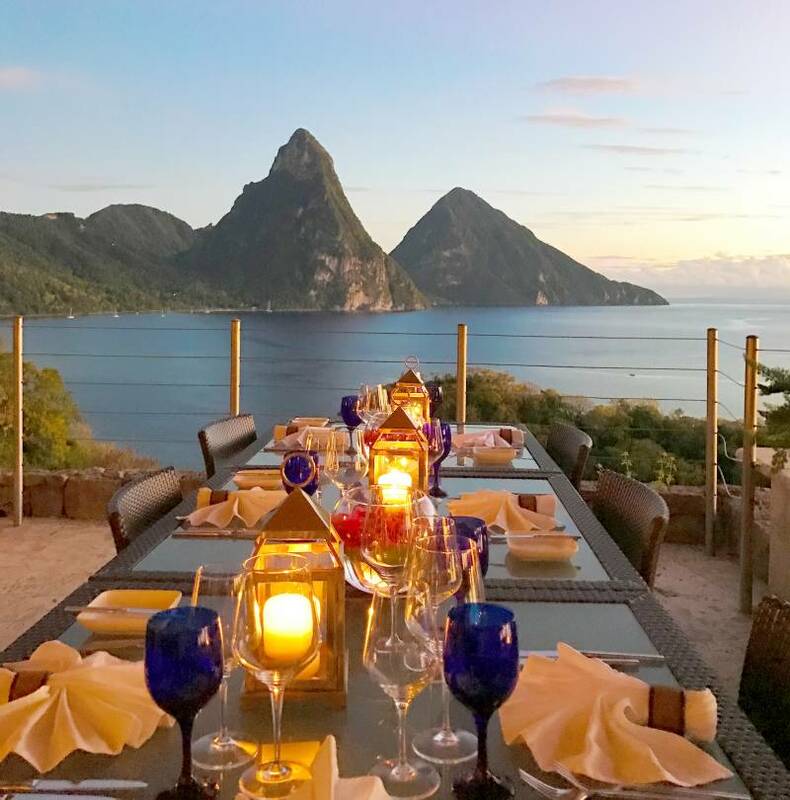 Whether you seek adventure, love nature, are a dive enthusiast, foodie or just looking for one of the most romantic Caribbean islands to spend your honeymoon, milestone wedding anniversary or looking for the perfect destination to host your destination wedding, keep St. Lucia on your short list. And as they say on the island: Let Her Inspire You. Linda, thank you so much for telling us all about the island of St. Lucia! It's totally next on my list of places to visit! 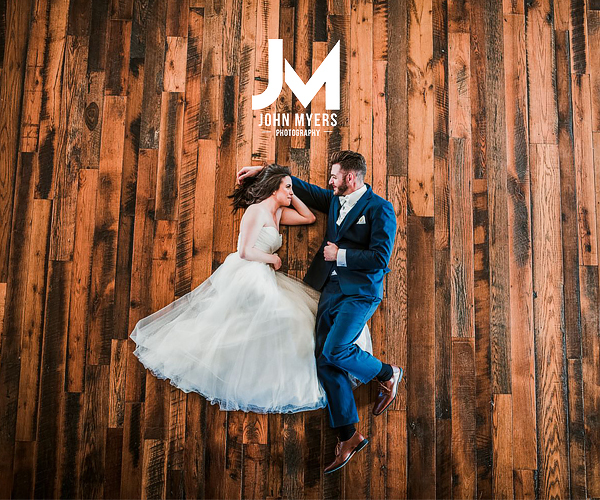 You can check out more of Linda, a Nashville honeymoon planner here on her website: https://lindadancer.com/. And be sure to follow all of her adventures over on Instagram! All photos provided by Linda Dancer of Honeymoons Inc. Wedding + Honeymoon Specialist Linda Dancer with Honeymoons Inc.